Luis de Garrido shared with us its house project in Seville, the Macarena House, which’s completed in 2001. 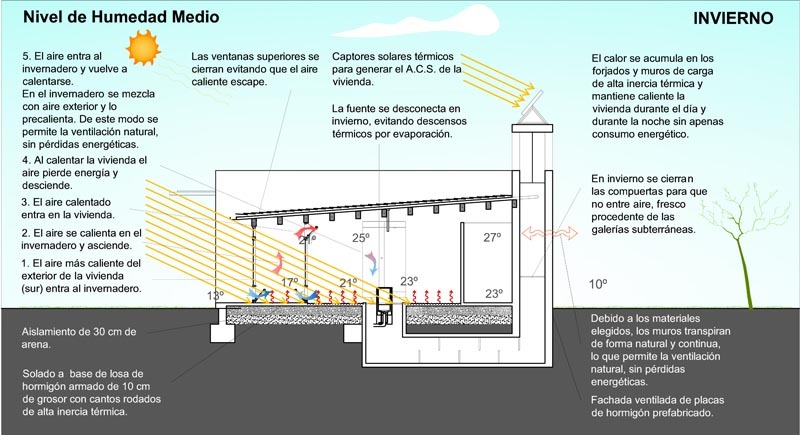 Below are additional images as well as project description, Google-translated from spanish. – Plan a low budget housing. 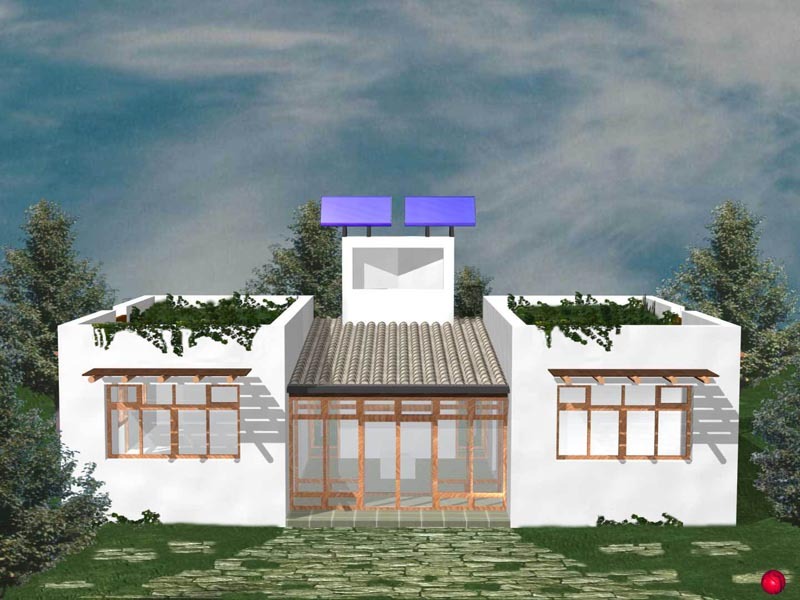 – Designing a house with a high degree of industrialization. – Projecting a high bioclimatic housing without heating or mechanical conditioning. This is a house with a very small, and very low cost, so that the architectural structure is very simple. Basically if two rectangles separated by a courtyard conservatory. 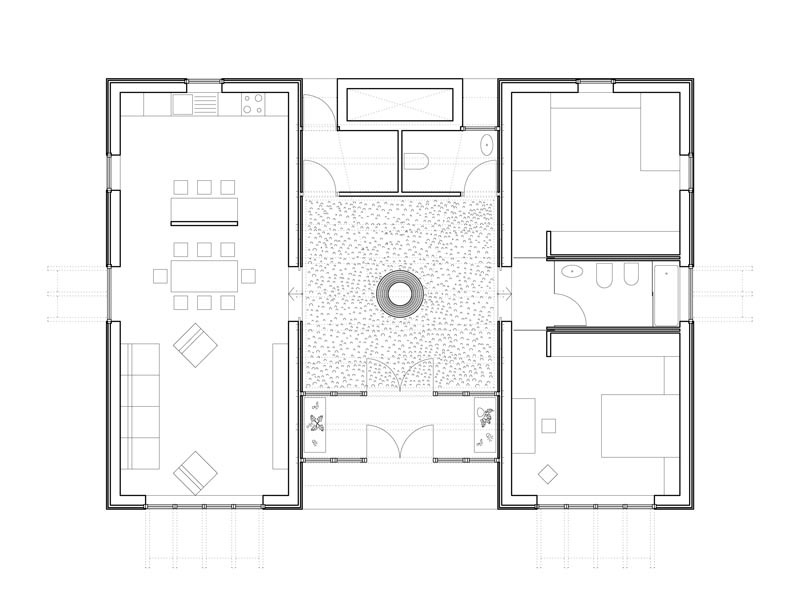 A module is the living area (living room / kitchen), and the other sleeping area (two bedrooms and a bathroom). 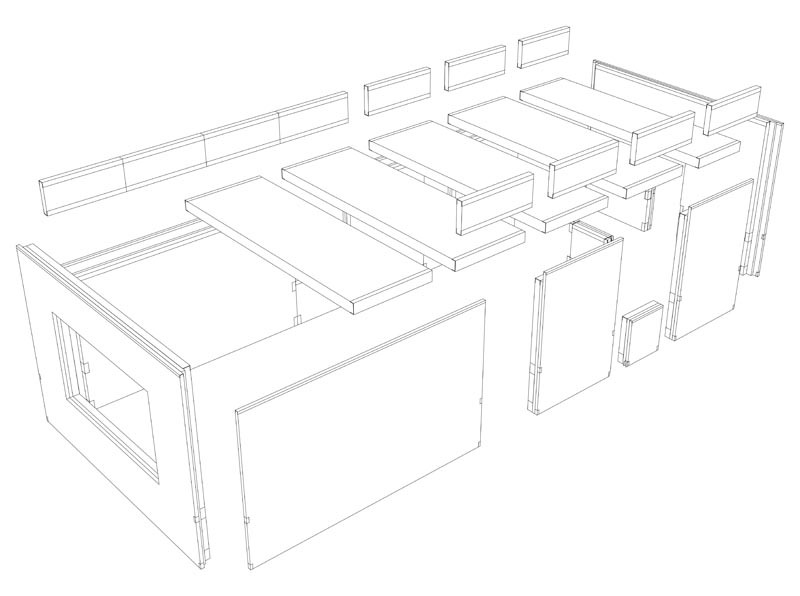 The central area can be reconfigured easily. In winter the central area becomes a huge greenhouse with double glass skin, and in summer it becomes a cool, shady courtyard. To make the transformation only needs to open a set of doors, windows and vents in the floor. The behavior of housing is especially effective in summer, to cope with the hot summers of Seville. 1.2. Manufactured resources. The materials used optimally leverage, avoiding the maximum possible waste through proper project and a high level of industrialization and prefabrication (construction load bearing walls of reinforced concrete slabs reinforced concrete slabs, sloping roof, carpentry, painting, …). The house was built with minimal energy consumption. The vast majority of materials are prefabricated, so has required a minimum amount of energy. On the other hand, housing has been built with little supporting resources, and with very little labor. 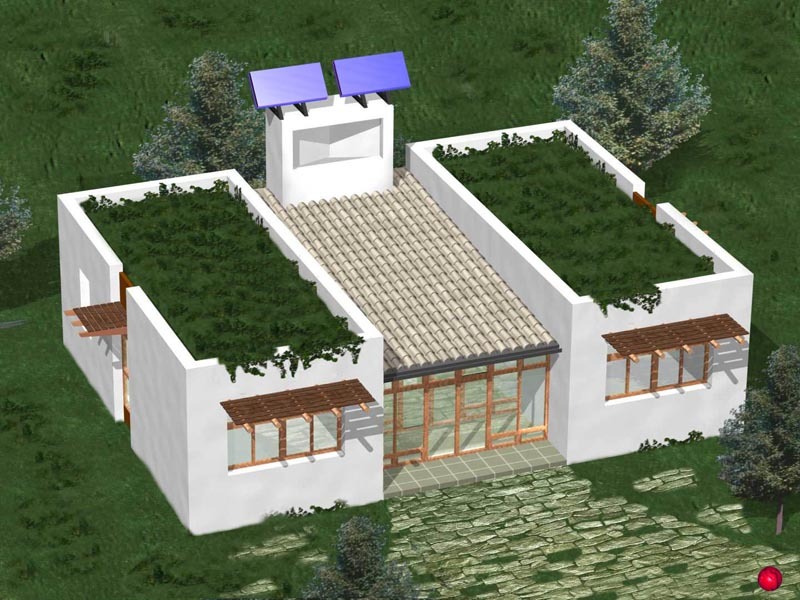 Due to its characteristics bioclimatic housing has a very low energy consumption standard. The house is heated greenhouse and two accumulators night rate. The hot water is generated by two thermal solar collectors. The house is cooled by architectural systems and requires no mechanical conditioning systems, so it does not consume energy for cooling. The vast majority of materials used can be recovered easily (once the life of the building) to be reused in the construction of another building (complete structure, covered, wooden beams, roofing tiles, ceramic tiles, windows, shutters , fences, gates ..). 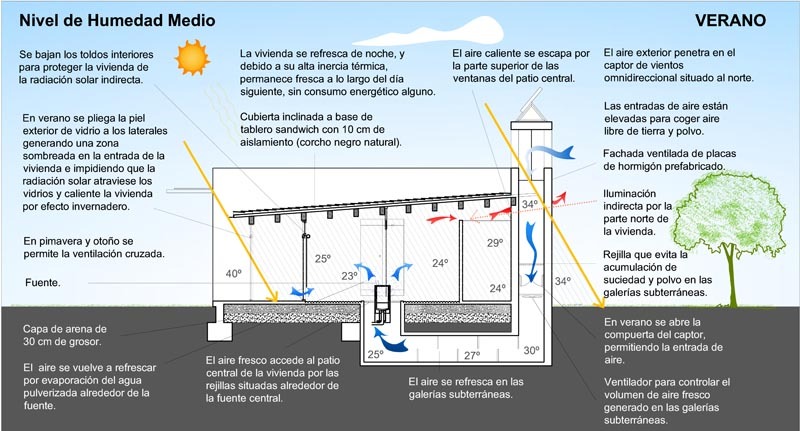 The energy used is of two types: Solar Thermal (two solar collectors for the ACS, and evaporation of water to air cooling) and geothermal (refresh system taking advantage of low air temperature at 2 meters underground in the galleries below the suspended floor of the house). Housing does not generate any emissions and does not generate any waste, except organic. The house has been designed rationally, and most of its components are industrialized, eliminating redundant items, unnecessary, or free, allowing construction to a greatly reduced price, despite the ecological equipment incorporated. The house is heated by itself, in two ways: 1. Avoiding cool: Due to its high thermal insulation, and having most of the glass surface to the south. 2. Because of his careful and special bioclimatic design, and perfect NS, housing is heated by the greenhouse effect, solar radiation and electric batteries to your nightly rate. Housing cools itself in three ways: 1. Avoiding hot, providing the bulk of the glass surface just south and west, providing sun protection for the direct and indirect solar radiation (a type of protection different for each of the holes with different orientation), and providing isolation appropriate. 2. Cooling by a cooling system architectural air through underground tunnels. On the other hand, due to high thermal inertia of the building, the accumulated fresh overnight stays for nearly all the next day. 3. Evacuating the hot air outside the housing through the upper windows of the central covered courtyard. The cover is tilted power of natural convection and provides an effective “chimney effect” to extract the hot air inside the house. The heat generated during the day in winter it accumulates in the floors and load-bearing walls, keeping the house warm during the night. Similarly, generated during the cool summer night accumulates on the floors and load-bearing walls, keeping the house cool during the day. The roof garden high thermal inertia, reinforces this process. 4.4. Transfer systems (heat or cool). The ventilation of the building is continuously and naturally through the very walls surround, allowing adequate ventilation without energy loss. This type of ventilation is possible as all materials are breathable (concrete, hemp insulation, paint silicates), although the whole performance has a completely waterproof. Two sheets drywall and insulation. The inner blade is the load bearing wall of reinforced concrete 15 cm. thickness (with high thermal inertia). The outer leaf of precast reinforced concrete is relieved of 6 cm. Inside the double sheet is a layer of hemp insulation 5 cm. and a ventilated air space of 3 cm. The floor is made out of prefabricated concrete slabs. Vegetable paintings. Polished Concrete Floors. Double panel doors plywood, beech plywood, and treated with vegetable oils. Roof garden, with an average thickness of 25 cm. ground. Sloping based sandwich board comprising: Viroc top board (wood chips and cement) of 13 mm, bottom panel birch plywood 13 mm, and internal insulation crushing black cork 10 cm. thick. Based coating asphalt and Moorish tiles. – Precast system supporting structure-based double wall (wall charge and wall covering), which allows total removal of the dwelling in order to facilitate the repair or reuse of all components, including the structure itself. 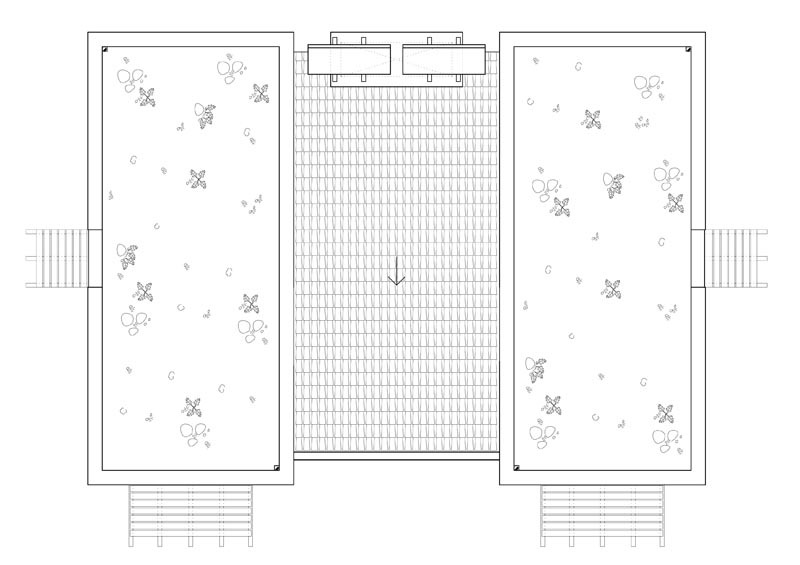 – Double glass skin of the central courtyard, allowing ventilation of the house in winter without energy loss. This double skin of glass allows the warm air vents, while increasing the efficiency of greenhouse gases generated. Similarly, when removing the glass exterior of the double skin of glass creates a shaded south of the housing, which prevents hot greenhouse, because solar radiation can not access the interior glass.